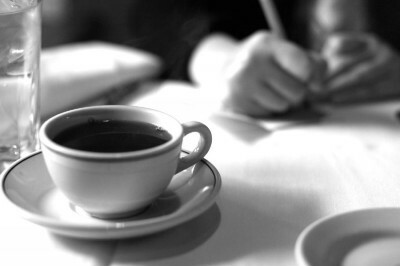 Coffee and writing have, for the most part, always been important to me albeit not always at the same time. 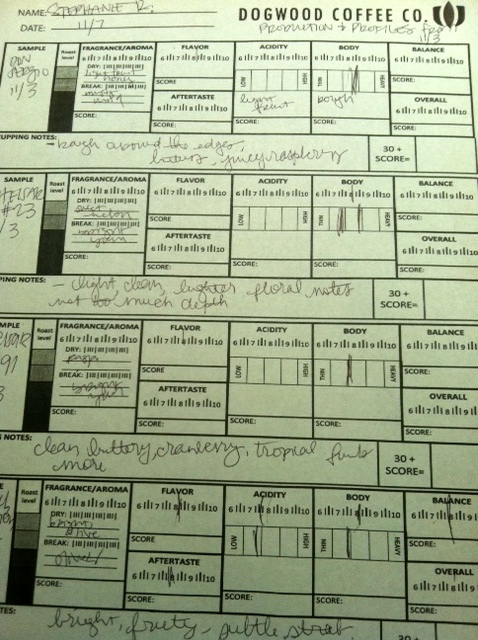 When I was growing up I wrote all the time and kept doing so all the way into college where I majored in English. In college all the sophisticated types, whether intellectual or not, drank coffee. Lots of it. I couldn’t stand the stuff. As I was figuring out what in the world I was going to do with my English degree post-graduation I started pouring coffee as a new team member, or barista, as they’re now known (I think), at a small local company (that ended up getting a lot bigger). It’s safe to say I picked up (and have continued) a pretty intense coffee habit during my time at the company but as my coffee drinking increased my writing pretty much stopped altogether. Over my six years there I worked in the stores, dabbled in real estate (which allowed me to spend a good chunk of time in Detroit where I discovered the Star Deli on 12 and Telegraph), and I when I left I was a “financial analyst” which was a title that I kind of made up. But at no point during my tenure did I do much writing which my over-caffeinated brain found bothersome. Now that I’ve been in my current career for twelve years I’ve pretty much come to the conclusion that creative writing just isn’t something that people do in their everyday jobs. Clearly there are jobs out there where writing is core to one’s profession, a writer for instance, but there aren’t too many of them. I mean I write every day, a lot, but the majority of what I write are notes I’m taking while talking to folks on the phone. Not terribly creative stuff. Which is a long way of saying I may have found my next calling, roasting coffee. My best friend owns Dogwood Coffee Company and they honestly roast some of the best coffee I’ve ever had. It’s insane how good it is. 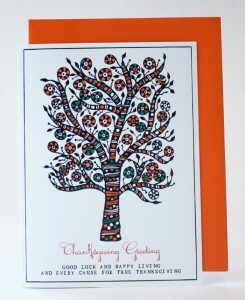 But the cherry on top are the handwritten notes they make during the roasting process. Every micro varietal gets a different treatment and every batch is, by definition, a little different based on a zillion factors. Most of it is inside baseball to me now but I’m a decent learner so perhaps someday the combination of writing and coffee may feature even more prominently in my day-to-day goings on. 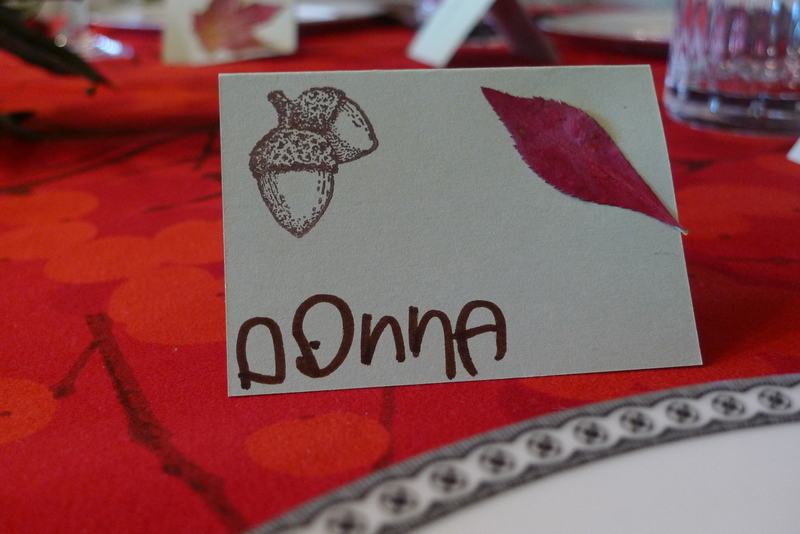 Last night I sat the boys down to create their first table setting cards for Thanksgiving. Emmett concentrated on writing all twelve names, crossing off guests as he went through the list, while Oliver stamped images of a turkey, acorns, a pumpkin, and wheat on the cards plus adding a glop of superglue for the leaves. 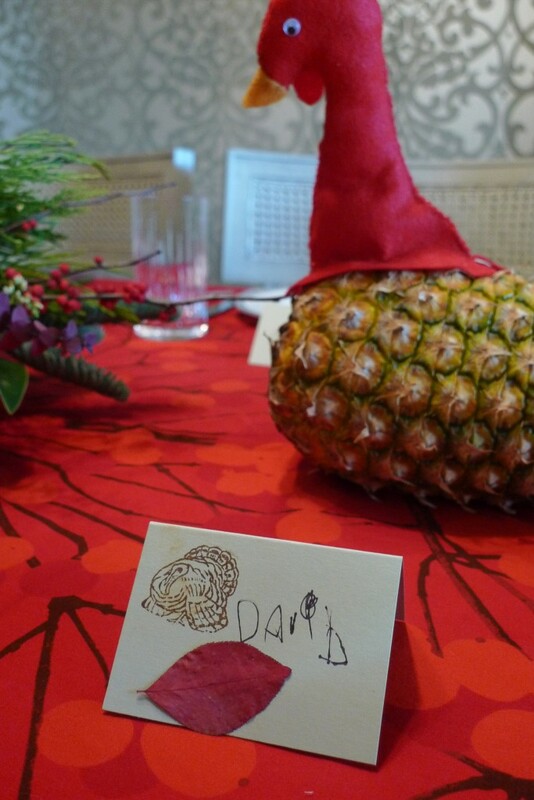 In the end, the cards looked smashing and the boys honestly loved creating the pieces. My favorite part was seeing the unique handwritten names. Most names began curving downward after the fourth letter and some names, such as the d in David looking more like a b, were backwards. These words symbolize our son’s growth over the past year, the passing of time which comes to mind in each holiday. I only hope he continues to enjoy writing in the future as much as he does at this moment in this life. Here’s to hoping your Thanksgiving is filled with all those reminders of how blessed we are to be living in a country where our children have the opportunity to embrace the written word. 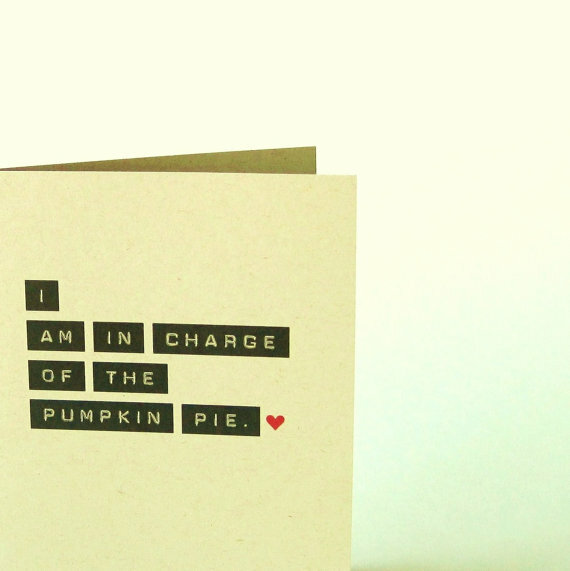 We also hope your stomachs are filled with as much pie as possible…and potentially enjoy a slow walk around the neighborhood to let the gifts of the day digest. P.S. 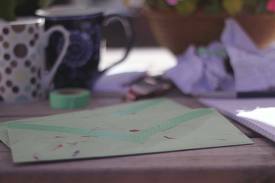 This Saturday Minneapolis based Lunalux will be hosting their monthly Stationery Saturday event…an especially unique card this time around. Here’s your chance to watch your personalized letterpress stationery be created on an original Heidelberg Windmill letterpress printer. 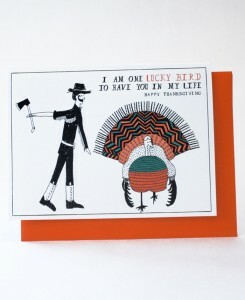 A perfect holiday gift! That passage was in an article titled “Sincerely Yours” by Andrew Peterson which was in Whole Living magazine and it grabbed my attention one cool November night last year. What had happened to the days of letter writing? 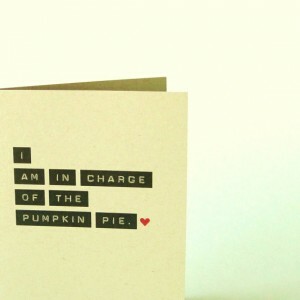 Birthday cards, check. 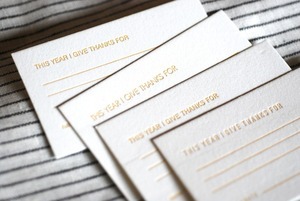 Thank you notes, still a priority. Postcards, occasionally. 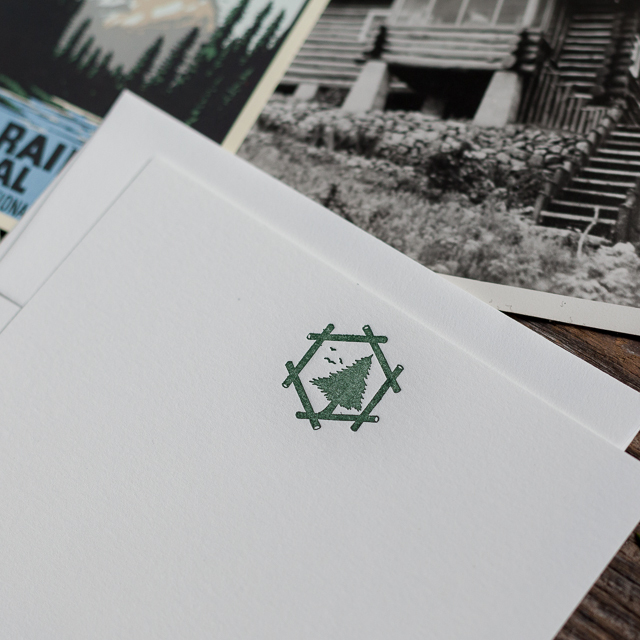 But when it came to actual letter writing as a form of communication…well, it had been years. Where had that need gone? The obvious answer is the inexpensive cell phone calls, evites, the internet and, more recently, texting. Once all of my high school and college friends were online by the mid to late 90’s, the need to send letters became obsolete. I’ve kept a stack of letters from my junior year abroad in college. They are priceless. 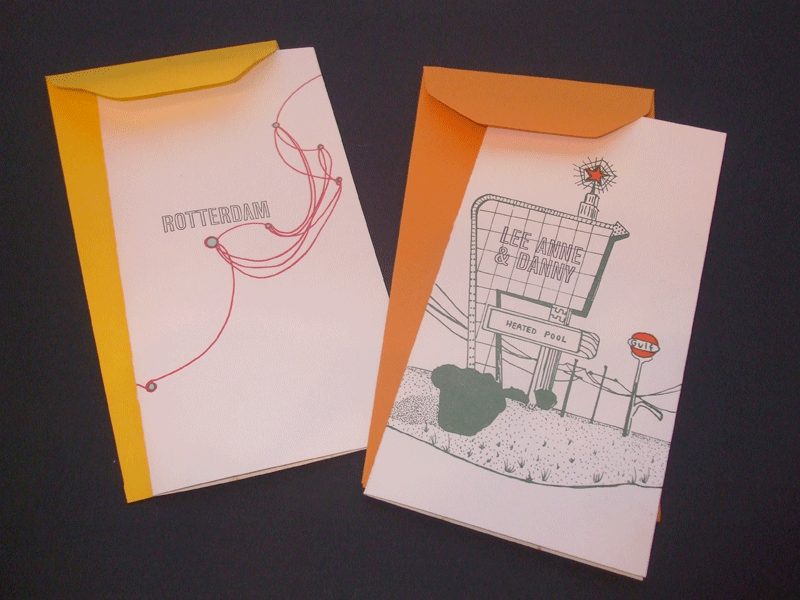 That far away from home you would occasionally buy a phone card to ring a friend studying overseas as well and decide a time and place to meet in the weeks ahead but mostly it was through letters. It was cheap – but it was also all we knew. Most kids abroad these days use skype, email and the phone to reach friends. They might be connecting faster but the personal touch has been lost as well as their own reflection. These letters I’ve kept are as important as any journals I’ve saved over the years. 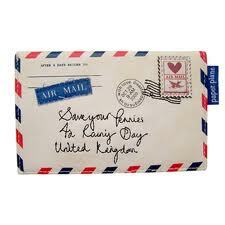 You cannot replace mail stamped from the Italian, French and Australia postal service in 1994 with an email. A good friend of mine in Portland, Katherine, and I have recently begun writing letters to each other, communicating exclusively via snail mail vs. any other option. I’m crazy about this exchange. Katherine, whom I see maybe once a year, has touched this piece of paper I am holding and this is the ink which came from her very own pen. There is an energy in this letter which would never come through online or even on the phone. When I notice her letter in between all the junk mail and bills, it stands out clearly from all the rest and is immediately opened. I can’t say the same with an email written be Katie. Looking back at the Whole Living article it suggests how one can use this applied mindfulness and make a difference in his or her own life. It was such a simple article but one that deserves all the credit for being the idea behind brown ink. 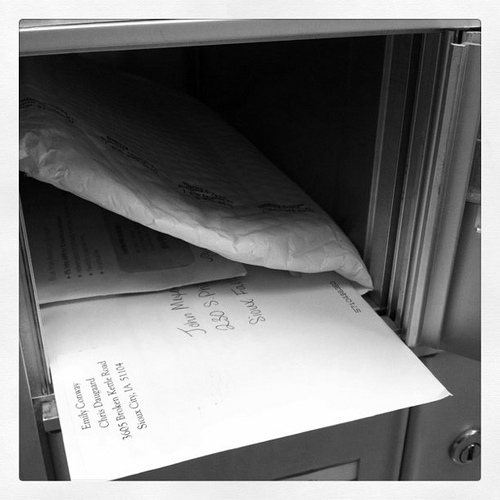 The thrill I get when I receive an unexpected letter in the mail trumps all other modes of communication and it’s that excitement that keeps me heading to the post office, both as a receiver and a sender. With next week being Thanksgiving it’s natural to be thinking of all the ways I feel thankful for those around me. 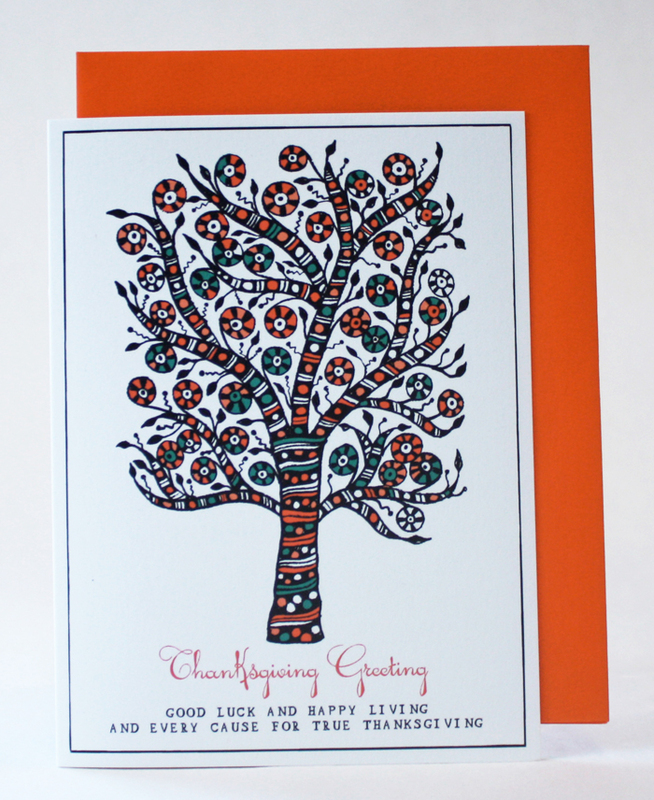 How about stepping out of your box and reminding a certain someone just how much they mean to you by sending one of these beautiful, hand-drawn artwork cards from Mr.Boddington’s. This will be our third year hosting Thanksgiving, a tradition I adore. While our kid’s eyes will be glued to the Macy’s Day Parade, the smells of the kitchen will start brewing and continue until the last coffee cup is washed and slice of pumpkin pie is devoured. 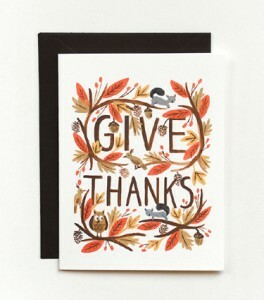 One new tradition I plan to add this year is asking each guest to jot down what they are thankful for over the past year on these cards from Paper Source. I’ll hold our guests thoughts in the attic until Thanksgiving ’12 when they’ll be reminded of their thoughts of this year and ponder how another year flew by. 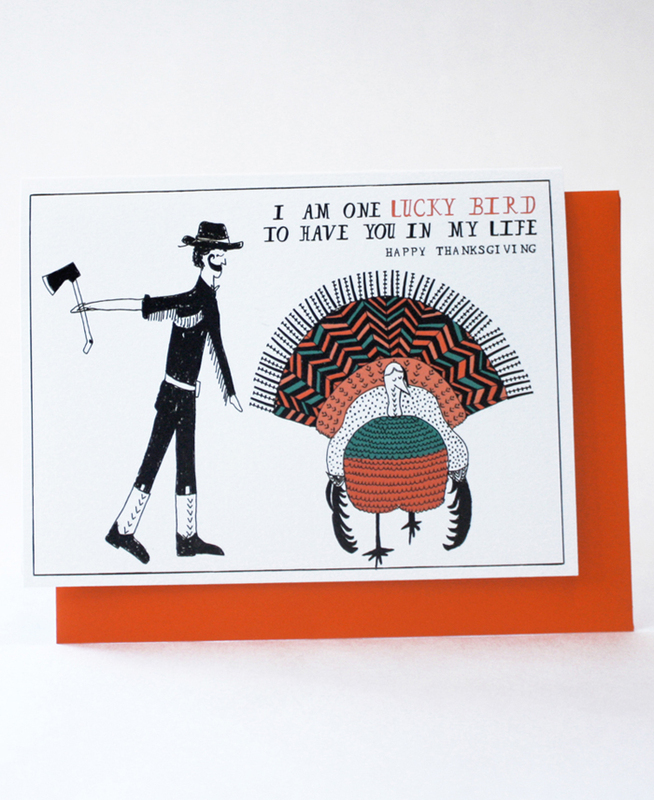 Satsuma Press also has sells a unique way of listing what you are thankful for this year. And if handwriting is just not your “thing” this holiday, we hope you find an outlet to share your blessings with others in whatever style that feels right. With our boys, they’ll be screaming “OOOOOO the Lord is good to me…” at the top of their lungs no doubt. Last month I had the privilege of volunteering at Emmett’s school Book Fair. I say privilege because it’s truly such a treat to see these kids walking up to the register with sparkles in their eyes, digging in their pockets to find crumpled up bills to pay for their new shiny books. Be it a vampire series or Dr. Seuss, these kids were book hungry. Not only were they excited about books but every other customer was purchasing a pencil or an eraser. Right on! Of course, what really got my heart pounding were the kids walking up to the check out table with journals. Ahhh. Not just the girls, boys picking up journals as well! No fooling. 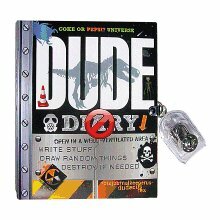 The boy’s journal, DUDE Diary, has a strong male overtone which potentially helps when going against the norm while purchasing such a book. 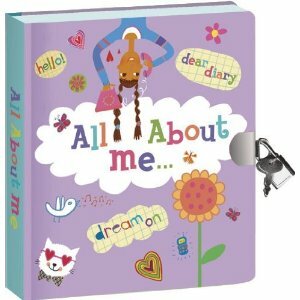 It’s not surprising there’s quite the variety of girl themed journals but my favorite, All About Me, diary even has a lock and key. 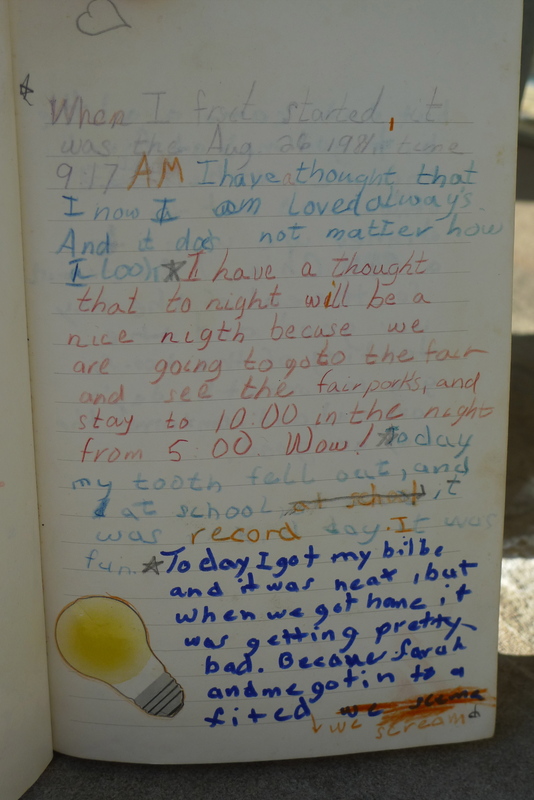 A particular third grader named Ava mentioned this was her third journal…in third grade. Hello? Can you say a future Miss Wendy Longacre? I about jumped over the folding table to give her a scary stranger hug. You go Ava. I actually did ask her if she might provide me with a short interview sometime to learn more about her writing. She didn’t seem hesitant. And her father didn’t shoot me down with the “who are you?” glare either. I like these folks. So here’s to those young readers and writers out there who still find the desire to pick up a pencil or pen to scribble out their highs and lows of the day rather than texting or emailing their BFF to share current emotions. We all need a place to download and breathe…privately. 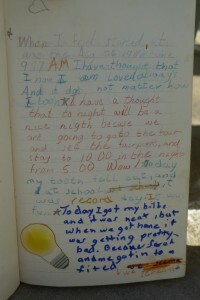 As I child, journaling was my haven. This was the one sacred place I stored all of my fears, excitements, disappointments and wishes. 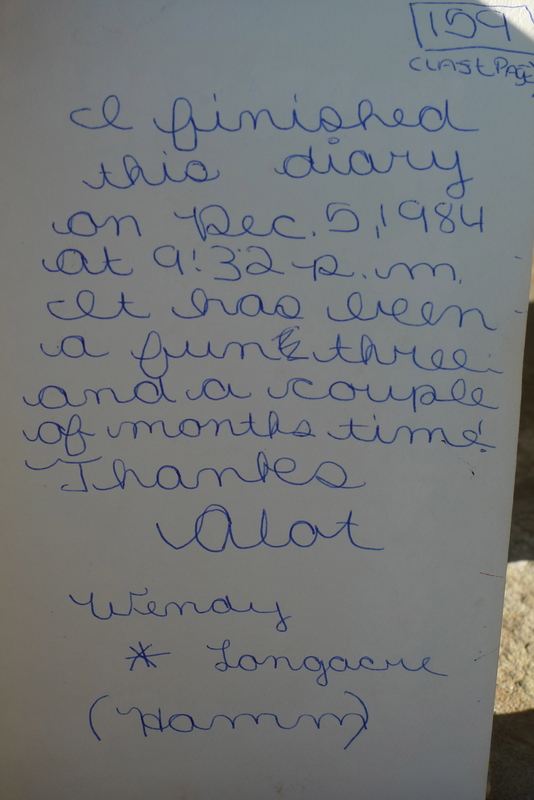 My first journal began when I just turned 8 years old. I’m sure it was a gift since I can’t imagine myself asking for a journal as I entered third grade. There was nothing too fancy about the QuillMark journal. 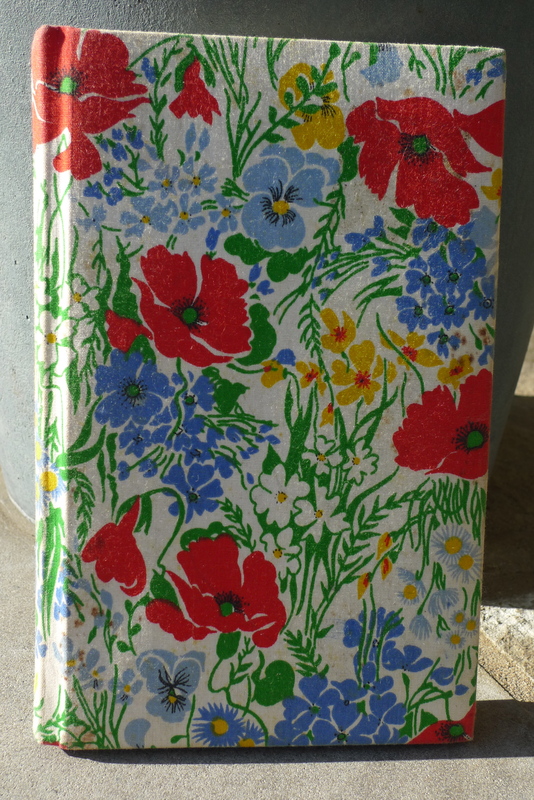 The margins were wide enough to hold all kinds of writing and the cover was made of soft cloth with a preppy, flowered pattern which made sense for the 80’s. My first journal stayed with me for a little over three years. Aside from the vastly different topics between 3rd and 6th grade, what amazed me the most was the change in my handwriting style. From the simple print with a bit of a D’Nealian touch (we’ll come back to D’Nealian in a future post) to thick cursive where the word “locker room” takes up one full line. The more I think of it, my very first journal is valuable not only by holding a glimpse into my younger years but also symbolizing the beginning to a way of life which has brought clarity, problem solving and verifying progress through all kinds of times. What a gift.